Alice's Adventures in Wonderland (commonly shortened to Alice in Wonderland) is an 1865 novel written by English author Charles Lutwidge Dodgson under the pseudonym Lewis Carroll. It tells of a girl named Alice who falls down a rabbit hole into a fantasy world populated by peculiar, anthropomorphic creatures. The tale plays with logic, giving the story lasting popularity with adults as well as with children. It is considered to be one of the best examples of the literary nonsense genre. Its narrative course and structure, characters and imagery have been enormously influential in both popular culture and literature, especially in the fantasy genre. The journey began at Folly Bridge near Oxford and ended five miles away in the village of Godstow. During the trip the Reverend Dodgson told the girls a story that featured a bored little girl named Alice who goes looking for an adventure. The girls loved it, and Alice Liddell asked Dodgson to write it down for her. He began writing the manuscript of the story the next day, although that earliest version no longer exists. The girls and Dodgson took another boat trip a month later when he elaborated the plot to the story of Alice, and in November he began working on the manuscript in earnest. Lewis Carroll's first appearance of Alice's Adventures in Wonderland was a much shorter work titled Alice's Adventures Under Ground. Although the final product is well known for John Tenniel's memorable illustrations, Carroll himself illustrated his original manuscript. In fact, many of Tenniel's illustrations were actually based on Carroll's own. 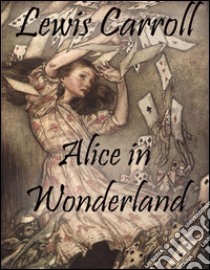 Carroll gave the original, handwritten manuscript to Alice Liddell, the girl for whom his heroine was named.